Thanks for the feedback. Yes, in this list of Darwins, equal allocations is quite impressive. Individual Darwin: You can do this now, just type in a single Darwin symbol. Presently, if you enter a list of Darwins, it assumes equal weighting. I do have parameters that I support for variable weightings, but the demo web page does not support these parameters at present. In my version for equities, I impose a minimum 5% allocation, but I removed that for Darwin's since commissions are not an issue. I could add it back in if there was a consensus. 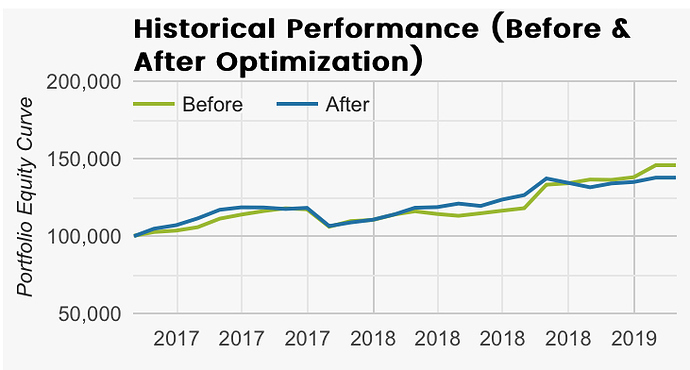 Min Variance optimizations usually will lead to lower returns performance. And although it is counter-intuitive, a Max Sharpe Ratio portfolio can actually have lower returns than another portfolio - which is therefore better optimized for returns - but may carry more risk. BTW, I'm not imposing a minimum allocation weight, so I don't remove Darwins - but the optimization just allocates them very small weightings. Still a work in progress, so happy for feedback. I imagine the Optimization uses equal weights per year to the historical returns, but I would appreciate being corrected if that is an incorrect assumption. I am considering adding KVL to my portfolio. I added it to my portfolio in the Optimization and it was only allocated a tiny percentage. My guess is because the average annual return may be low compared to others. The issue for me is his returns and scores have been considerably increasing each year but that doesn't seem to be considered. If my assumptions are valid I don't think I would want to configure a portfolio only on the allocations presented by this service. Nonetheless I really appreciate having this available and being able to see the affects reallocation can have. That is the reason why these kind of tools need the possibility to have a custom start. Yes the Custom Start Date would certainly be helpful in many ways. But that still would not allow consideration for a Darwin with annual improvements over its full history. And conversely one that is getting worse! Loving the creation of this great tool and thanks for sharing! However I have a question regarding the explanetion of things. Perhaps I misunderstood things in translation. Does '' optimized '' relate to a lower volatility and/or better sharpe ratio where improvement relates to the change in net ROI? Thanks in advance and have a wonderful day. It is the Goal button : Max Sharpe or Min Variance (volat). Improvement relate on Sharpe. If you select Goal of Min Variance then it optimizes for lower statistical variance. If you select Goal of Max Sharpe Ratio, that returns the portfolio with the highest ratio of Reward/Risk. By the way, I am evaluated these metrics on daily returns. Net ROI is not one of the Goal selections offered. Congrats and thank you very much for your app. Is this tool still active? @Karayel yeah it seems to be working just fine, I just checked. Look at the instructions, you gotta login with username: darwinex@i4cfinancial.com, password: special, then select DWNX as your country, then enter darwin names, etc. Thanks @yhlasx for replying. Yes, @Karayel, it's still available. Enjoy. I can send you / to chew in return. You’re already in the hall of fame of merit. Congratulations @ManFromGlad for this great tool ! Make a new thread of your portfolio goals and analysis - I am sure it would be worth it. For what is worth I am leaning to your conclusion as well - concentrate on few good money managers or at the very least not too many! Part of the content is locked for visitors without registration. Yes, that's the concept that comes to mind. Ideally by pushing the logic to the extreme, my goal would be to invest under-invested Darwins, so that my participation will take a proportion of monopoly in the long term. Darwinex reiterated that in the future, first-time buyers of Darwin could be valued in one way or another, one of the rewards envisaged would be to grant them a divergence better negotiated than the last arrivals, or another "gift". So the earlier we get in the queue, the less we invite people to join, the better we will be. Secondly, the Darwins are now blocked by the Capacity Manager. As I plan to make additional contributions, it is therefore for my sake that the Darwins remain unknown so as not to push to lock them by membership. Conclusion, I will give a metaphor of the goal: my unacknowledged goal is to place me in a position of performing a “public tender offer“ (just like with corporate stocks’ share) on Darwins that I’m eyeing: hold more than 50% of their share, take control is the intended purpose Hypothetically, I’d like to become the main shareholder to thwart any reversal of Darwinex evolution that would disrupt performance ... that's the basic idea!